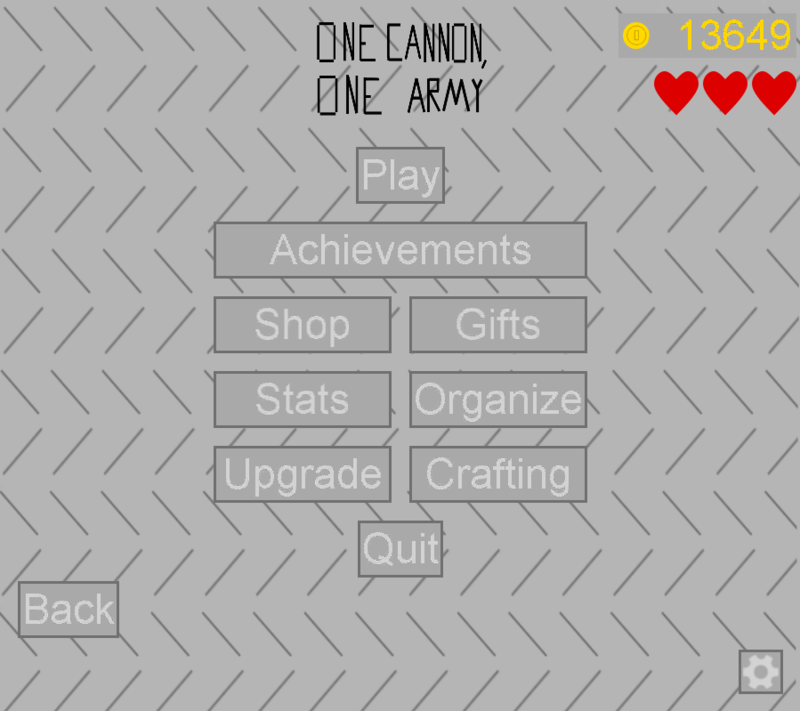 I'm working on a game called One Cannon, One Army (abbreviated to OCOA). This game is about using your cannon to shoot various projectiles at different types of aliens to stop them from destroying the earth. You have a guide (who is basically the tutorial) named Tucker to aid you in your mission. Additionally, you can purchase more powerful weapons and upgrade your cannon as you level up, but the aliens will become more difficult as well. Eventually, you'll face the boss alien (I still have to come up with a name for him/her/it), which I have already coded (the boss is immune to all status effects and shoots lasers at you). The game also has achievements, which add more goals to the game other than defeating the boss. Here's a new feature I added, which plays an animation when you transition between menus. Again, any feedback is welcome! I want to know what you guys think so that I can improve this game for everyone. Additionally, if you have any ideas for aliens or projectiles, please tell me. So far the projectiles are: rock, cannonball, fireball, bomb, dart, poison dart, laser, lightning, and a sort of magic blast thingy. The aliens I have are: Normal, Defense, Fire Defense, Chaos (which attack you), and Boss. Alrighty, I've got some new features to show to you guys. There are four major features that I've shown here. Lasers - The laser is the most powerful weapon in the game. It flies really fast, and it also deals a ton of damage. But, best of all, the laser applies a "plasma" effect, which does 10 damage per second. That may not seem like a lot, but, currently, the most powerful alien (excluding the boss) has only 11 health. You can start buying lasers at level 22. Chaos Aliens - The previously mentioned second-most powerful alien is the chaos alien. It's the purple one you see in this gif, and it has the power to shoot powerful chaos blasts that do 11 damage. The chaos alien has 11 health, but has high defensive stats that keep it safe from most weapons (I may raise the health later). These aliens are unlocked at level 18. Shields - The little brown rectangles under the aliens are shields. 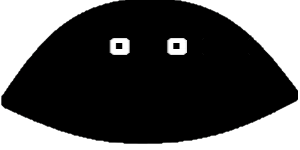 They each have 5 health, but they act as a separate entity, meaning that you must first destroy the shield before the alien. That also means that even if you're facing a regular, weak green alien with a laser, a shield would make your attack take two hits, not just one, despite your powerful weaponry. Because of this, shields are pretty powerful. However, there is only a 1 in 5 chance that an alien will spawn with a shield (for this demonstration, I turned this up to 100%), and shields are unlocked at level 8. 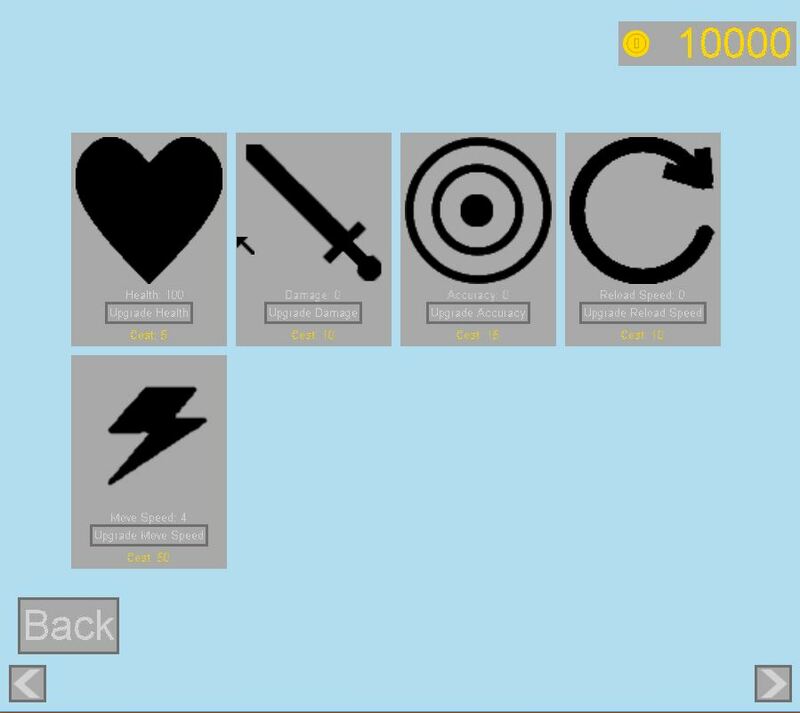 Weapon Selection - At the bottom, you can see a rocks and lasers (and the amounts of each that you have, but that's covered by the Screencast-O-Matic logo :/). By clicking on the projectiles at the bottom, you can select which one you'd like to fire. Once you run out of a certain projectile, the game will switch to another, random type. That's all for today! Remember, I really need new ideas for projectiles and aliens (especially aliens!) If you have one, don't hesitate to suggest it. Also, if you have any feedback/criticism, please tell me. I want to make this game good, and a developer's idea of a good game is different from a gamer's idea of a good game. You guys know what you want to see, so please tell me if you have a suggestion. Thanks for reading this post, and I look forward to sharing more features, and, eventually the final game, with you all. Hello everyone, today I have an exciting Valentine's Day update for you! Here we have a demonstration of leveling up and a screenshot of a table I created that show the new things for each level. As I add more projectiles and aliens, less and less of the cells will be blank. Please, I really need some ideas for new aliens! I really need you guys to help me out! And, as always, any feedback is welcome! Thanks for reading, and Happy Valentine's Day! Today, I have a bit of a lengthy post. I can get a lot done in a few days, so I had to make a choice: Write longer posts less often, or shorter posts more often. I decided not to spam you guys, because that's kind of annoying. Today I'd like to show you a new projectile I created: The Frozen Blast (name subject to change). This projectile does light damage and slows down aliens when it hits, making them easier to defeat the next time (also, aliens cannot attack while frozen). You unlock it at level 10, and each one costs 11 coins. The boss alien cannot be frozen. I really like the Frozen Blasts, because they add a bit of strategy to the game. For example, an alien could be close to you, and you can either keep shooting whatever you're using at it, or use the Frozen Blast. The Frozen Blast costs you time, but will save you some time as well. It all really depends on how close the alien is. I know it's hard to tell with these garbage gifs, but the aliens' eyes now move. I feel like this makes them feel more alive. I'm probably going to improve this feature as I progress. Right now, I'm working on health bars above the aliens, so you know how close you are to killing a particular one. Some future goals are to complete the implementation of customizable controls, as well as add subtitles (and sound, but you can't hear sound in gifs, and right now, my computer has some weird problem where I need to reinstall something for the sound to work during debugging). Oh, and one more thing: I've decided on a name for the final boss: Malos. One, it just sounds cool, but the Latin root "mal" means "bad", so I figured it kinda fit the aliens, with them trying to destroy Earth and all. Sorry about the length of this post, and thanks for reading! 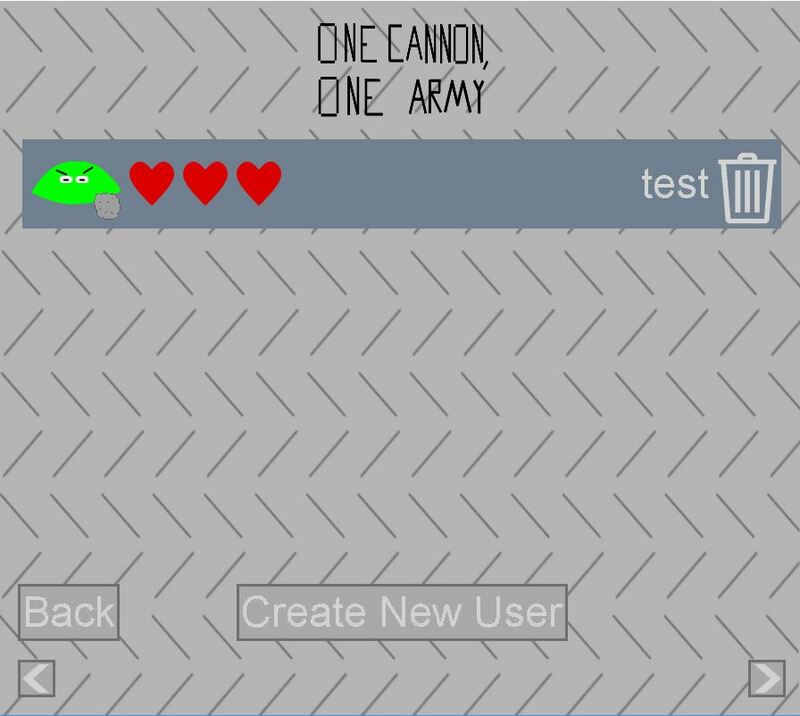 I'd like to show off a few of the new projectiles I've been working on for One Cannon, One Army. I've added meteors and hammers to the game. The meteor induces the fire effect, which does 2 damage per second. It also deals 10 damage and unlocks at level 16. Each meteor costs 15 coins. The meteor is the brown rock-looking thing. Hammers deal 5 damage and unlock at level 5. They also cost 8 coins each. This is meant to be an early projectile, as it is the fourth you can unlock (behind rocks, cannonballs, and darts). They deal a little more damage than the projectiles that you have access to at level 5, but they are costlier. Another thing you saw in the gif was the health bar changing color. This is just a nice visual feature I thought would be cool (I've noticed that in games, every little touch counts, and they can sometimes be the deciding factor in whether someone likes a game or not. For example, I think OCOA is much better than my previous game, MazeSnake, which barely had any animation). I've also added health bars above the aliens so you know how close you are to defeating them. 1. You can't save your progress in the demo. 2. The demo won't receive updates unless a common, critical bug is found. That's really all I have for you today. Thanks for reading this post! Man, do I have a lot of stuff for you today. Changed the name of the "Chaos Blast" to "Hex"
Changed the name of the "Lightning" to "Lightning Bolt"
Decreased the damage of the Plasma status effect from 10 damage/sec. to 7 damage/sec. It's my 99-day anniversary! To celebrate, here's a screenshot of what the alien who assists you in the tutorial will look like. I'm still working on a name, but he's gonna be an alien who turned on his planet to save the innocent humans. Come back in 4 days for the next update! Thanks for reading! Finally, I've created some new aliens! The Plasma-Resistant aliens, well, have varying levels of plasma-resistance. The Omega Aliens are more interesting. They are immune to all effects, and only take half the damage otherwise inflicted by projectiles. They also shoot meteors at you. And, finally, all the cells in the level-up chart are full! I'm gonna work on projectile crafting. This means that you must buy materials in the shop (or get them as alien drops) and use these to make projectiles. The materials I've thought of are stone, metal, gunpowder, poison, plasma, and many more. Crafting weapons is easy; you simply open the crafting menu from the main menu, then select the projectile you'd like to craft, then hit "Craft" or "Craft 10". Sorry this was a little later than usual. I had school and basketball. The game now has materials for you to craft with. The aliens will sometimes drop these materials. The materials are not unlocked at certain levels; you can buy any material at any time (this may change in the future), but the recipes are only available if you are at a high enough level to craft the projectile. Different projectiles have different recipes (visible in-game, as it'll take too long to list the recipes here). Here's a quick gif of me flipping through the different recipes. I may change the crafting displays to make them look nicer in the future. I've also brightened up the Frozen Blast projectile, as the light blue color was a little dull. I still don't have much of a game, if you think about it. I'm not sure whether I should do levels, or infinite gameplay (until you die, of course). I'm leaning towards levels but I'm still thinking about it. I also need to decide on what happens after you die. Some possible penalties are loss of coin and XP or a timer that makes you wait until you can play again (I'm probably going to do the first one). Additionally, I have some ideas for that "alien parts" feature I mentioned earlier (don't worry, it won't be called that in-game). For example, the aliens will sometimes drop eyes, which can be collected and crafted into your own alien minions. However, certain aliens require more than just some eyes and a body (not sure what the body is made of... maybe some flesh and bones?). The Chaos Aliens will require a bit of chaos energy, for example. As for the items, I honestly don't know what I'm going to do, except I know there will be a Malos Trophy. That's all I know. I'm starting to pick out songs for the soundtrack. If you know any good, free songs licensed under Creative Commons 0 or Creative Commons Attribution, I'm willing to take suggestions. I'm going to start posting every Saturday instead of every four days. Right now, I'm having trouble finding stuff to post. First I was sick for four days, then my computer wouldn't work, and now I have barely progressed in the game. I might not always be able to post on Saturday due to basketball. If that is so, I'll post on Sunday. I'm going to start reorganizing the main menu to make room for all the buttons I have to add, such as those to organize your inventory and hotbar and upgrade your cannon. Sorry for the short post, and thanks for reading! Unfortunately, I was not able to post yesterday as I had a basketball tournament. Fortunately, I can today, and I have a cool feature for you! I've added stat upgrades, which allow you to improve many stats that will make the game easier. You can't use them immediately; they're going to need to be unlocked at a certain level (though I'm not sure which yet). And yes, I know the page buttons aren't needed for the upgrade menu. I only have them there in case I think of more stats before I release the game. If not, those will be removed (ther shop is like this, too, and I will remove the buttons come release should it be necessary). 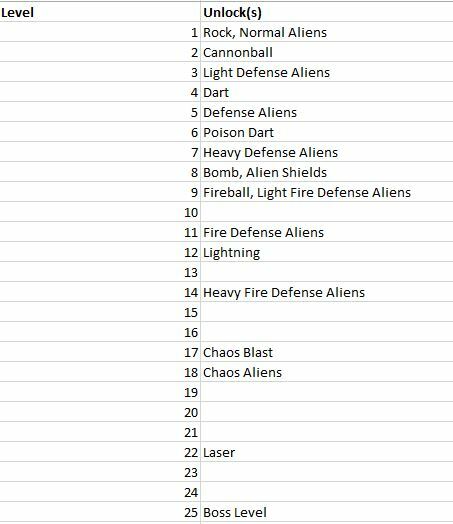 And while I showed you that list of features earlier, I'm not going to add launchable aliens or special items at the moment. Right now I'm going to work on an Organization menu that will include your material and projectile inventories, as well as the configurable hotbar. I'm also probably going to add an inventory maximum that can be upgraded in the upgrade menu. And I've decided on a game mechanic that I'd like to include. Right now, nothing happens when you die. I'm going to add a feature where, once you die, you're dead for a certain amount of time (the time will start short but get longer the more you level up and the more you die). You can revive yourself with coins based on how much time is left, and you can also use a special Revival Token item that you can receive as a reward in free gifts (which aren't implemented yet). Oh, and one more thing: Users now start with ten coins. I did this because I want to include material purchasing and crafting in the tutorial and you'll need some money to buy some rocks. That's all! Have a nice week! I've finally finished the organization menu (which I might rename to something else)! The menu allows you to view your inventory of materials and projectiles, as well as organize your hotbar. I've also lightened up the bomb texture a bit, as it is black and the mouse pointer is black, so when you try to drag it, the mouse pointer is no longer visible. It's barely noticeable unless you hover over the bomb texture. I'm working on a story, which will be shown using scrolling text during important moments in the story (I got this idea from Battle Cats). The game will feature levels, a majority of which take place on Earth. However, some take place on other alien planets as you attempt to thwart the aliens' plot to fire powerful antimatter lasers at the Earth, thus destroying it and ending all human life forever. 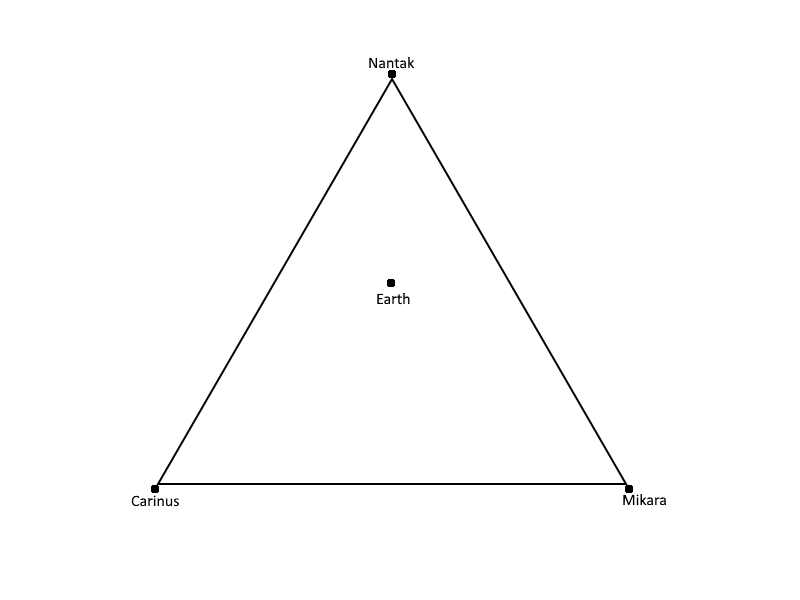 The aliens will need to have three lasers built at three different locations that form a triangle with the Earth in the middle. The lasers, combined, will completely obliterate our planet. Alone, they will cause devastating damage. Your goal is to stop the aliens from reaching Earth and, eventually, destroy the lasers to same humanity from extinction. Of course, I'm also working on the aforementioned death mechanic, as well as the missions (there will be 25). I'll probably remove the whole XP feature and have you unlock aliens and projectiles by completing missions instead. Also, I know that the tag that shows the percentage has been stuck at 30% forever. If I could, I'd set it to 40% but for some reason that's the only percentage itch doesn't allow you to pick :/ Once the missions are implemented, it'll be at about 55%. So I may finally increment the percentage sometime during these next few weeks! I'm sorry I posted on Sunday this week instead of Saturday. I was away from home all day yesterday and by the time I got back I was exhausted and went right to sleep. I'm also going to apologize because this post is pretty long. Basically, the story starts in a small town called Estherville, Iowa (no, I don't live there). By the way, all the cities mentioned in the game are real. There are some levels in Estherville, and then the aliens move across Iowa. Eventually they move on to major U.S. cities, and then major world cities. Finally, you lift off into space on a stolen alien ship, then go to the planets where the laser cannons are housed. Finally, you travel to Lithios and battle the final boss, Malos. Also, with the addition of missions, there will be no more XP and leveling up. You will unlock aliens and projectiles by completing missions. I've also improved the Malos boss battle. Malos will spawn in the center of the screen at the beginning of the mission. Every nine seconds, he fires a laser at you (this was already implemented). After 15 seconds, he begins moving from side to side, making it very difficult to shoot him. Also, normal aliens spawn during the whole battle, decreasing your health even more. 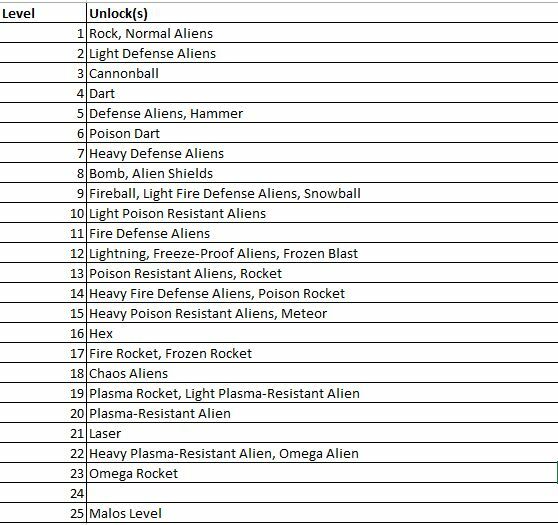 I've also made a minor change to the mission unlocks chart, moving Omega Aliens earlier so they can be used in the planet levels. Level 24 is now the only mission you don't unlock something at. It is a dark time on Lithios. Resources are low, farms are failing, and Lithians are dying. A dangerous disease runs rampant. Death's dark grip is closing on the planet. The Lithian leader, Malos, sees no other option; they must colonize another planet. With an army of his strongest warriors, Malos heads out for a distant sprial galaxy. Upon reaching it, they find an inhabitable planet. The only problem: That planet is Earth, and it is already inhabited. Fortunately, the solar system is rich with planets and moons that can support the Lithians. Unfortunately, the Earthlings will likely defend their solar system with thier lives. Malos devises a clever plan: Destroy Earth. After sending the message back home, construction begins on three deadly weapons on Lithios. Weapons with the power to ensure the Lithians' security in their new home. Weapons with the power to destroy a planet. However, one small, insignificant Lithian sees no purpose in destroying Earth. There was never an attempt to befriend the Earthlings; destroying them is ending more unnecessary lives. So the alien, named Tucker, heads for Earth to assist the small planet in its defenses. Malos begins his attack. All is dark, hopeless. Only a single person notices, named [username]. With a science experiment cannon and some small rocks, [username] alone must save the world. Alone, with no help. Or the Lithians will win, the planet will be destroyed, and humans will be exterminated forever. And, yes, the alien is named Tucker. That name actually has a significant meaning, though (look it up!). I have a special task for him to complete, which I hope will make the game feel more exciting. Again, don't wanna spoil anything. And here are some few minor changes: The defense aliens previously had a chance of dropping stones. However, I've realized through testing that metal is used a lot more. Thus, Defense Aliens, Light Defense Aliens, and Heavy Defense Aliens now drop metal instead of stone. The normal, green alien now has a chance of dropping stone. You may notice that the progress for the game has reached 50%. This was such a huge part of the game that I was able to jump from about 40% to 50% in a week (for some reason, itch.io doesn't have a 40% tag). What's funny is that the game wasn't even going to have missions like this. I planned it to be infinite, but when I started testing it I realized that it was really boring. So now we've got different goals for the missions, and I might add even more variety to make the game even better. Alright, I think it's time to let you guys go and enjoy your Sunday now. Sorry for the lengthy post; I did a lot this week, so I had a lot to explain. Next week's update should be shorter. Have a nice week! Sorry I didn't post last week. I did all the missions, and decided that I needed a break. However, I took too long, and when Saturday hit, I only had one tiny feature to show for myself. (I'm also going to apologize for the quality of my screenshots. Snipping tool is terrible.) So, I'm sorry. This week I'm back. And I made sure to have a cool feature (at least, I think it's cool) to give you guys to make up for last week. So, apologies done, let's get to business. I have something to show you: Trophies. You earn trophies by defeating aliens (for now. I may add more tropies later). Right now, there are six trophies: red, orange, yellow, green, blue, and purple. Malos drops the red trophy, fire-resistant aliens drop orange trophies, poison-resistant aliens drop yellow trophies, normal aliens drop green trophies, defense aliens drop blue trophies, and plasma-resistant aliens drop purple trophies. Of course, they don't always drop a trophy. There is a 5% chance for any Light-level aliens (and normal aliens) to drop a trophy, a 10% chance for a normal-level alien to drop a trophy, and a 15% chance for a Heavy-level alien to drop a trophy. I've also increased the chance for aliens to drop materials on death. There is also a new menu within the organization menu for you to view your trophy collection. As you can see, I've also changed the buttons at the bottom from words to icons. Right now, they're positioned weirdly. I'm going to have to fix that later. Now what? Well, I'm finally going to work on the death penalty I told you about before; where death results in the loss of a life. You'll get three lives, and one life every 30 minutes. Each minute of this you bypass costs you two coins. So, to "buy" one life, you need to pay 60 coins. I also want to add free gift that you receive every 24 hours. Included in these gifts can be coins, materials, projectiles, and maybe lives (multiple items can be included in these). I may add the purchasing of gifts, too. Another thing I've been thinking about for a while is the ability to sell items. With the addition of trophies, this is even more useful. Sure, trophies are cool, and you can use them to show off how good you are, but maybe you don't want them. So I want you to be able to sell them, along with projectiles and materials. 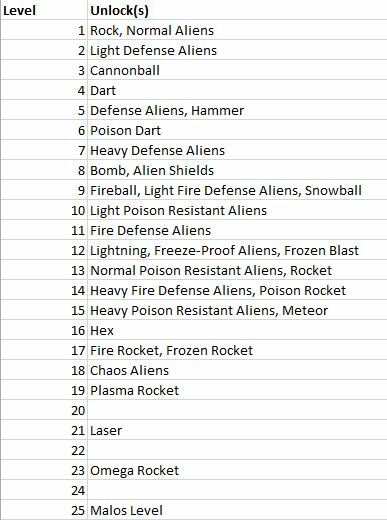 I also want to have more stats, like one for killing each type of alien, and maybe one for firing each type of projectile and one for purchasing each type of material. I'd just like to provide players with more information on how they're playing. Finally, I'm working with a release date, which is currently November 5, 2017. However, this may change. Check out my blog! Go to purasusite.wordpress.com for updates on games and software that I'm developing. That's all for today. Thanks for reading, and happy gaming! Again, I've been unable to post on Saturday. In fact, I'm changing the regular posting day from Saturday to Sunday, since I always end up posting on Sunday anyways. One feature that I'm on the fence about is the ability to launch alien minions. I'm not sure if it will fit into the rest of the game, and I'm leaning towards not implementing it. Finally, I'm not sure about next week. I have a basketball tournament on both Saturday and Sunday, and I might not be able to find time to post. Hopefully I'll be able to do it at some point, though. Thank you for reading, sorry about the short post, and happy gaming! So I didn't update twice. I know that's kind of annoying. And I'm not going to update for a while after this, because the features I'm getting to aren't interesting (such as miltilingual support). 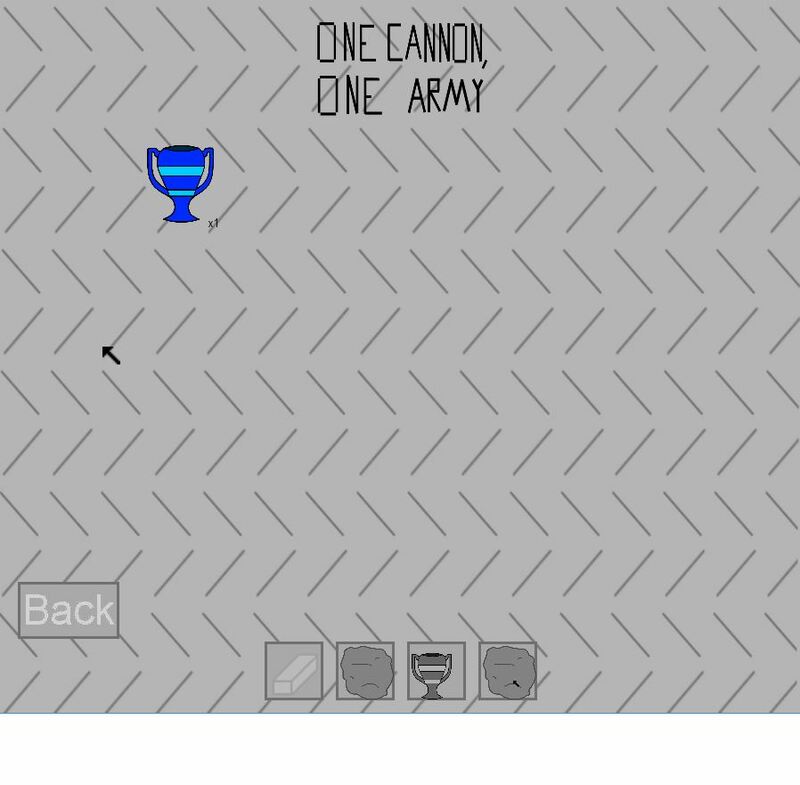 I added more cannons to the game: Bronze cannons, Silver cannons, Gold cannons, Master cannons, Inferno cannons, and Frozen cannons. The Inferno cannon adds the fire effect to projectiles when shot; the Frozen cannon adds the frozen effect to projectiles when shot. All of them (including the Inferno and Frozen cannons) add to the other stats like damage, move speed, and accuracy. However, buying a cannon will not carry over upgrades from another cannon. Each cannon has its own stats. This includes health. So, that's really all I've got. I'm going to start adding languages to the game, then I'll probably get to the configurable controls and sounds. I also have to create a tutorial (I'll post updates when this starts) and the ability to sell items. Sorry that this was such a short post and such a long wait. Thanks for reading, and happy gaming! It's been 100 days since I started this devlog, and while to some it may not seem like a lot of progress has been made, there has been a lot of it. I went from an infinite game with no achievements, upgrades, stats, and missions, to a game with all of those and more. I've started to make progress translating into Spanish, but there's still a lot of work to do to get OCOA translated into all the other languages as well. 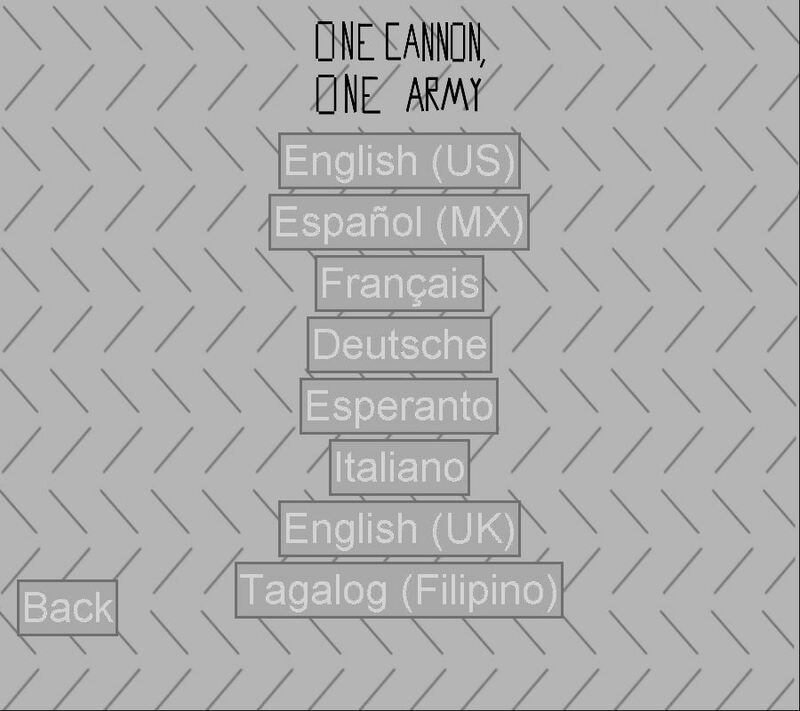 Right now, I just wanted to list my plans for the future of One Cannon, One Army. I only have a few features left, and so soon I can start testing and get to work on some of my other projects (such as a pro version of the Language Generator and MazeSnake 1.1). First, I'm going to finish Spanish translations, and maybe translations for French as well. The other languages will come in a later update. Next comes configurable controls. I've had this feature ready for some time and really just need a UI for changing the controls. I've known that I want this feature for some time, and the values are already incorporated into the game (so all I need is a way for a user to change those values). After that, I'll work on the tutorial. I know what I want to do with it and how it'll work. I'll post updates on that once I get working on it. Then I'll add in sounds and subtitles. I've got some sounds already downloaded and ready to implement, as well as a soundtrack I'm starting to build for the main menu. Finally, I've got a boatload of bugs and miscellaneous features to add. These are all small but when combined into the list I've got, it's a big undertaking. The features include (but are not limited to): improving the textbox, error handling, cleaning up the code, changing the alien shield image, improving graphics, and descriptions for different items. So thanks for lending me your ears (or, eyes, I guess). See you later, and have a nice day. I've finally finished the Spanish translations. I've also implemented the language menu which allows you to change the language (currently, only Spanish works). A lot of the work I've been doing is just making the language change when you click the button (you should have seen some of the weird positions and shapes of some of the buttons before!). Next, I might start translating into French, or maybe I'll start implementing a configurable controls menu. 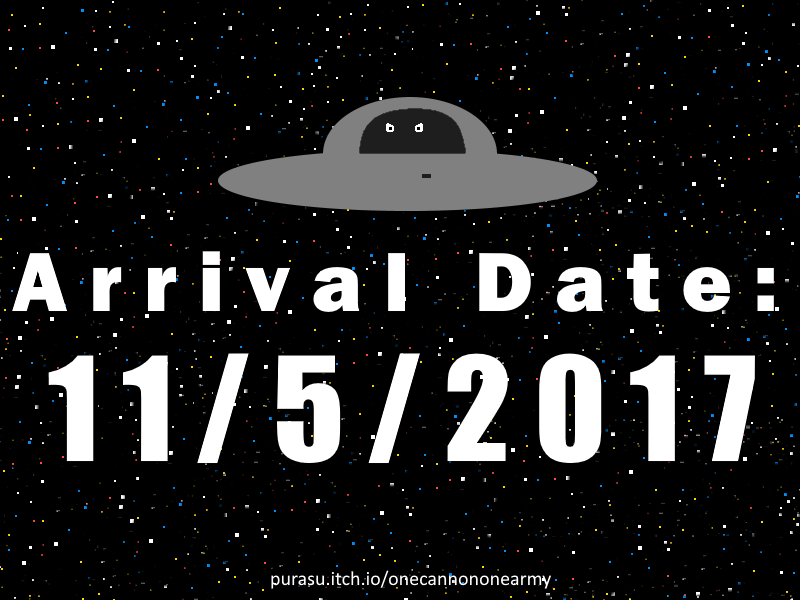 Anyways, thanks for reading, and have a nice day (160 days 'til release)! Hey guys, very short update here. I know it's not Sunday yet, but I wanted to tell everyone that I've published the page for One Cannon, One Army. 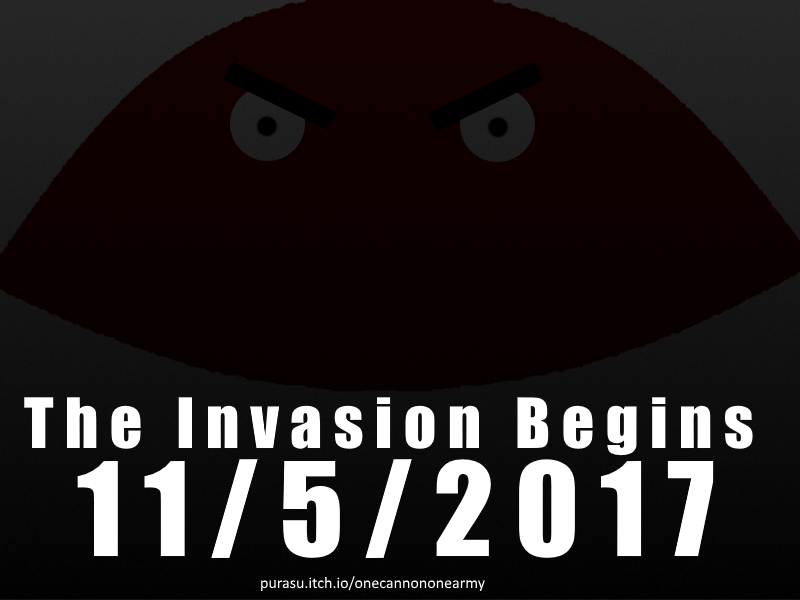 Simply go to purasu.itch.io/onecannononearmy to see it. Hope you guys like them! I'm going to try to add pre-ordering in (not sure how it works; how does itch distribute the actual file? How does the placeholder work?). The game will cost $3.49. Thank you for reading, and see you guys this Sunday! I just completed a nice feature: Configurable controls. I added a menu for them, which was a lot easier than I thought it would be (the whole menu took about 2 and a half hours). To change a control, you simply click on it, then press the button you'd like to set it to. You can use any key on the keyboard, even ones such as the Windows home button (though this is advised against). Also... did you notice? I got a new screen recorder! This means I'll probably add gifs to the page and maybe even make a trailer. This also means that my screenshots and gifs will have much better quality. The reason for this is that I got a new computer. This one is faster and more powerful than my old one from 2011 : ) And now I have more free time. so OCOA should be ready for me to test soon! Then I can start on LangGen Pro. Okay, so I know that was short, so here I'm gonna tell you what I'm doing next. I really want this interactive tutorial done, so that's my next goal. The ideal situation would be that the tutorial takes me a week. After that, I'll likely begin to implement user settings, and when that's done, the ability to sell what you've collected. Finally, I'll probably do free gifts. I'm still wondering if I should add this feature; I watched a video on how the psychology of free gifts works, and I don't really like the thinking behind it (for info on that, look up "Skinner box techniques"). Thanks for reading, and congratulations to all who graduated recently! I'm very surprised it was so quick. I implemented a feature where I just type some values into a list, and the tutorial will play through. This makes it easy to implement more stages (I did something similar with the missions). The little alien there is Tucker. I've also made a few more changes; first, the story now plays BEFORE the tutorial, instead of after you sign in for the first time. I've also implemented an intro. There's a long intro, and a short intro. The longer one will play through the first time you open the game, and after that, the shorter one will always play on the start. The short intro just fades in and out of the Purasu logo (like in MazeSnake). There is also a new popup that comes up the first time you run the game. It will ask you to select your language so you can get through the story and tutorial. I've also made some minor changes. The Frozen Blast projectile is now known as a Frost Hex. Also, the plasma status effect now does 6 dps instead of 7. Not sure what to work on next; likely some of the miscellaneous features I've built up over time. I have a list of 27 things to do; so it'll take me a while! I'll probably show you guys some of them next week. Today is a bit of a small update. I didn't add a whole new menu or translate into another language. Instead, I added a feature for materials, projectiles, and cannons that displays basic stats and a description when you hover over them. This makes it easier to decide which projectiles to craft and use, and view stats for your different cannons instantly, instead of having to select them and then go to the upgrade menu to check the stats. The little descriptions don't have anything to do with the game; they just make the game feel less number-oriented and more realistic. I've also added the ability to sell items! You simply right-click on an item in the organize menu (projectile or material) and then click "Sell". You may have noticed that I changed the backgrounds for some of the interface components to have a border. Before, some did, and some didn't, so I just added borders to all of them to make the game look better. And now, future ideas. I'll probably add a new alien that shoots back at you, and them implement them into the levels. I also have ideas for three new projectiles. That's it. Thanks for reading, happy Fathers' Day, and I'll see you next week! I've added three new projectiles and one new alien. There is also a new alien: The Ninja alien. Ninja aliens are white and fire shurikens at you. They have 25 health, the same defense as a Defense alien, and deal 28 damage if they come into contact with you. With that said, I've also made some small tweaks. 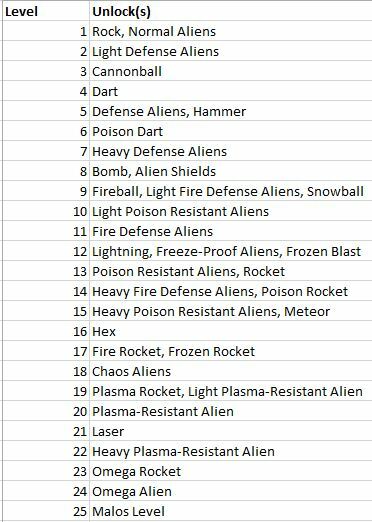 The Omega alien now has 30 health (from 15) and the Chaos alien now has 25 health (from 11). The rockets now only do 13 damage (from 15), bombs do 9 damage (from 13), and fireballs do 2 damage (from 0). And also, Malos' (the boss alien) defense has been decreased to 85% (from 95%). Most of these changes were because, previously, Malos was the only alien who could survive a hit from a rocket. I don't want the rocket to be too powerful. Also, previously, projectiles' effects were applied as soon as the alien was hit. So if the projectile had the fire effect, it would apply that damage once it hit, and every 2 seconds after that. Now, they don't deal that damage initially. However, the frozen effect still starts once the projectile hits. Another thing I've added is two new columns in the hotbar menu so that all the projectiles can fit (with 7 spots for future projectiles). 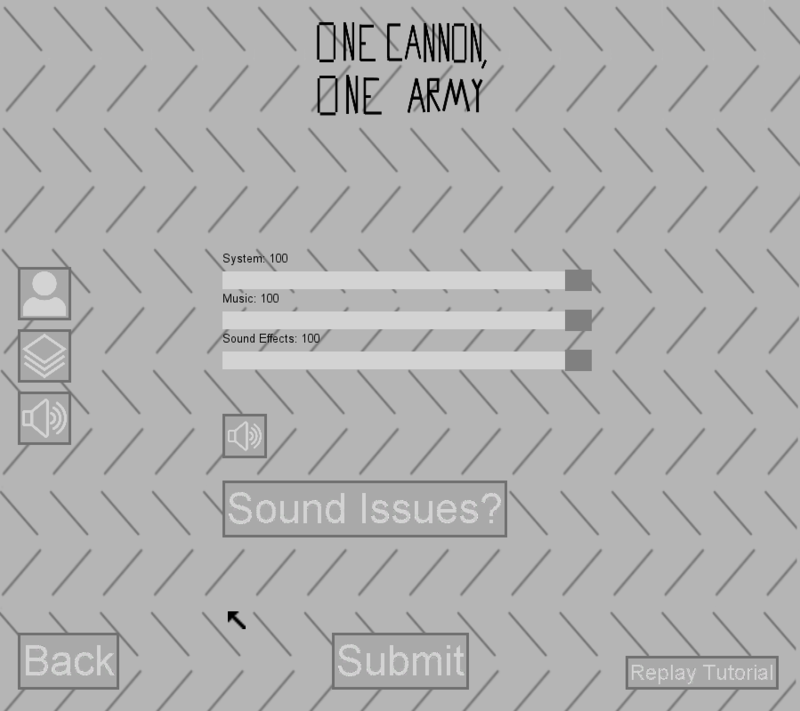 Next: I really do want to begin to add sound into the game. I've finally fixed the issue with my computer and I can program with sound now, so that's got me really hyped to implement sound in. I won't really be able to show you that with gifs, but I can provide the freesound links to sounds that I use (I've already got some really cool boss battle music picked out). Most likely though, I'll finally add a settings menu. You may have caught a glimpse of the button in the past, and so I'll most likely start working on the menu. Well, that's all. Thanks for reading, and I'll see you next week! So, as you can see, it's kind of a small feature, though it took a bit of time to implement. Next week: Gifts. There will be many different kinds, and you'll be able to purchase gifts in the shop and get a free one every day. Also, the game is very close to beginning testing! I only have a few things to work on, before I start playtesting. I'll stop posting to the devlog when that happens. 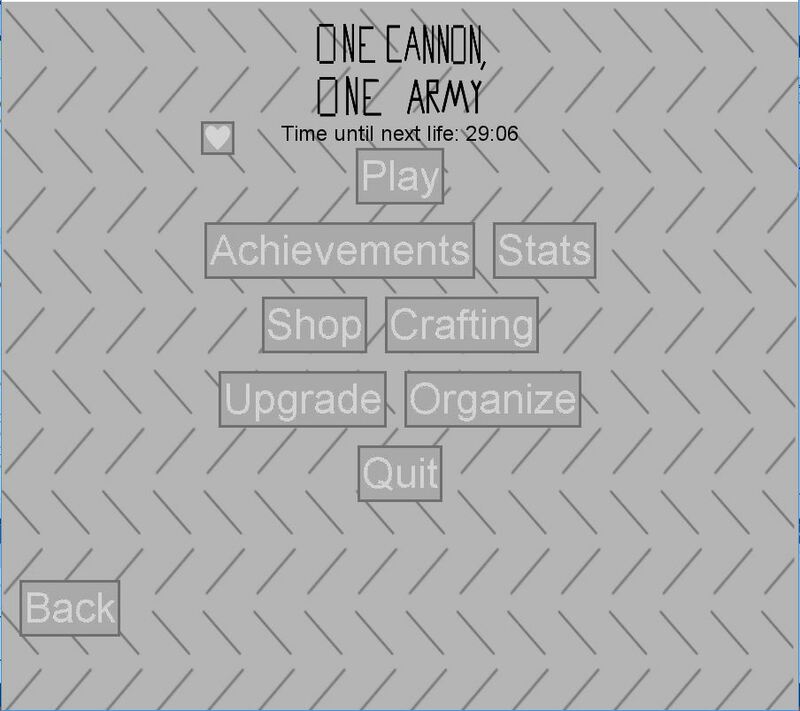 This is likely going to be my last devlog for One Cannon, One Army. I've implemented one of the last major features: Gifts. Now, you will receive a free gift every day. The gift types are Red, Orange, Yellow, Green, Blue, and Purple. The further you get down that list, the better the contents of the gift. You can also buy gifts in the shop. However, the shop gifts cost the maximum number of coins the gift can yield, so you can't try to cheat the system and buy a bunch of gifts to increase your coins. You can only break even. Just a note: The sound issues button allows you to reinstall DirectX, which is the same way I fixed the sounds not working on my computer (and it appears to be a common problem). I actually find this kind of ironic. The main menu is one of the most basic features of any game, yet I'm still fixing it in the last devlog. It makes it feel like everything has come into a complete circle. All that I really have left are a bunch of small features and bugs to fix. I also have to add the credits in and finish up the sounds. Then, I'll begin testing and have the game to you on November 5th. I've also rated the game based off of my rating system (purasusite.wordpress.com/ratingsystem). It's a Yellow (ages 8+). You can see the full rating details at purasu.itch.io/onecannononearmy. Thanks for reading, and have a great next 119 days! One Cannon, One Army is almost ready for testing! The only thing I have left to do is translate the subtitles, and double-check the copyrights on the sounds I'm using. After that, I'll begin testing out the game, on my own and with friends and family. Testing will not be available to the public. I'm expecting to begin building up more public interest in the game. Maybe a trailer? 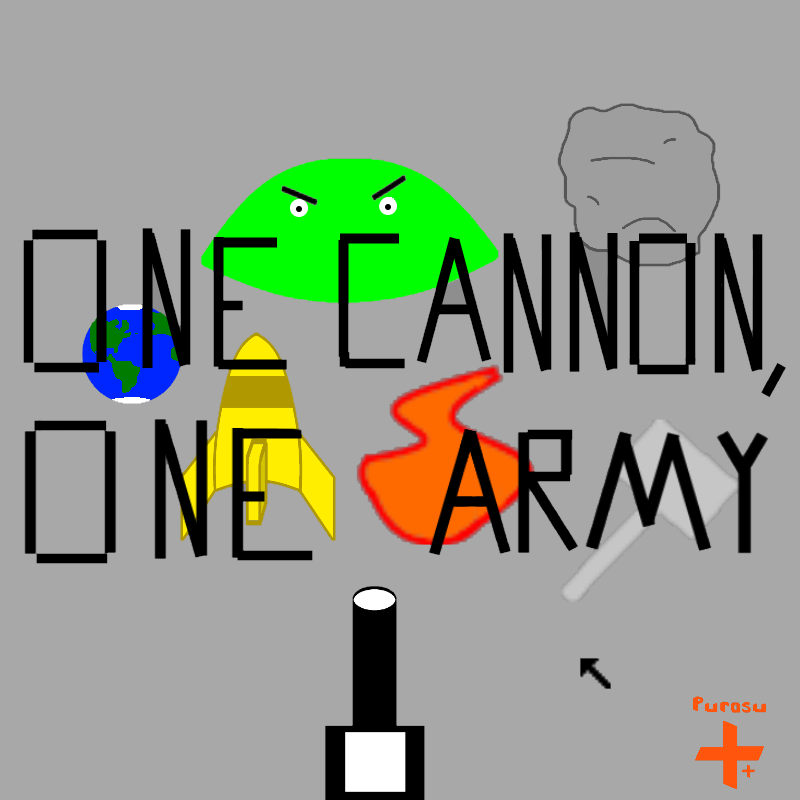 Anyways, be on the lookout for One Cannon, One Army on itch.io on November 5, 2017! Initial development for One Cannon, One Army is complete. I will begin testing with friends & family soon. 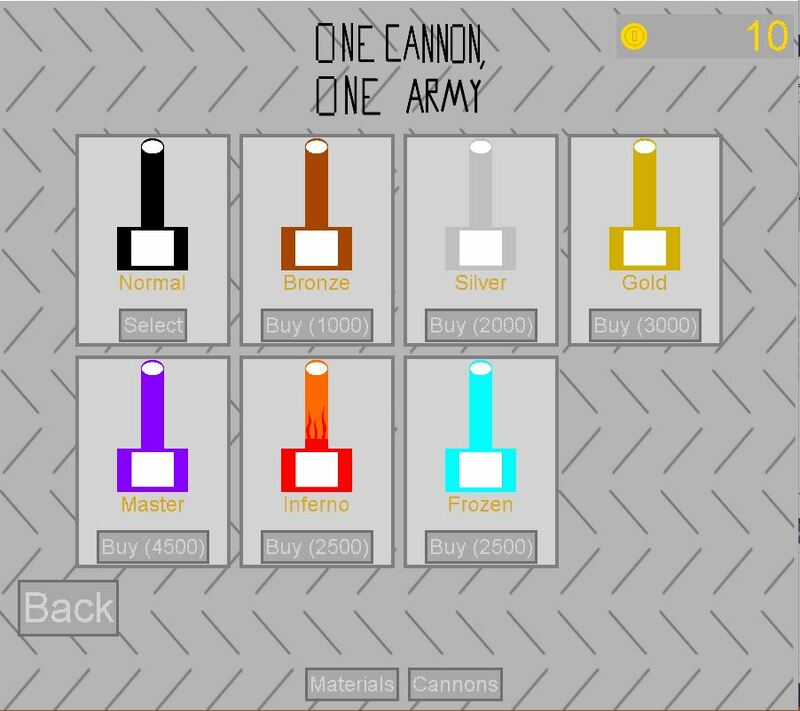 One Cannon, One Army is now available! The price is $3.49 The game is free and you can download it by visiting purasu.itch.io/onecannononearmy. Enjoy!